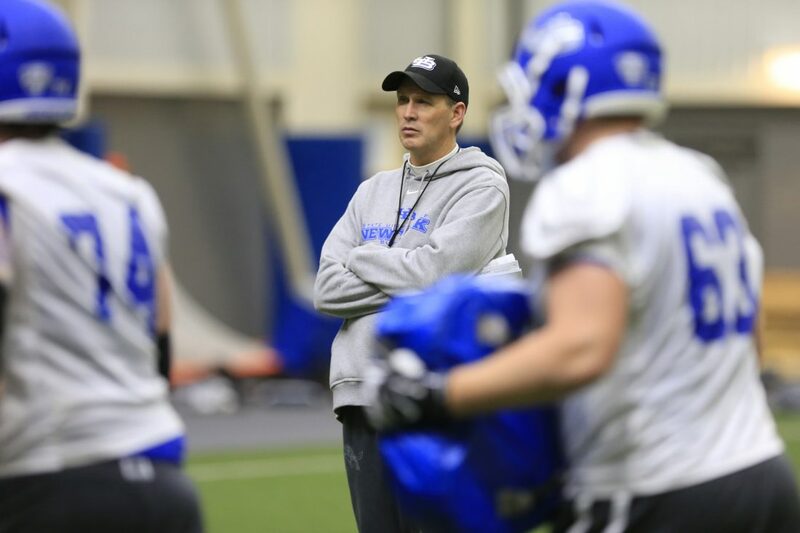 CANTON, Ohio -- University at Buffalo football coach Lance Leipold thinks his house is getting in order. In a figurative sense, the family room is not yet fully furnished, and the in-ground pool remains a hole in the back yard. Is the kitchen updated with the finest appliances? Not yet. But Leipold looks at the basement and sees the cracks in the walls repaired. The windows don’t leak. The squirrels are gone from the attic. You get the picture, right? Leipold thinks the foundation for success in the Mid-American Conference is in place. UB is coming off a 2-10 season. It’s no surprise the Bulls were picked for fifth out of six in the East Division of the Mid-American Conference in the preseason poll released Wednesday. But after bringing in three recruiting classes of still-young players, Leipold expresses confidence that his third year at the UB helm is going to be better. A year ago at this time the Bulls, hadn’t settled on a starting quarterback and were reeling from the death of defensive end Solomon Jackson, who had collapsed during a routine offseason conditioning workout. The MAC is all about player development. There are no five-star recruits who show up a sculpted 6-foot-6 and 335 pounds, as they do in the Southeastern Conference. Leipold says he’s thrilled with the body transformations being made in the second year under strength and conditioning coach Ryan Cidzik. It should be noted last year’s conditioning numbers were down some because Leipold greatly scaled back the strength program as players coped with the shock of Jackson’s death. Still, Leipold says strength and conditioning is the underpinning to the football program. It would be a surprise if UB had a winning record this season. Leipold’s recruiting classes have been promising. But the senior class, which should be leading the way, is thin. Only five seniors originally recruited by UB are projected to start this season (that does not include three other seniors who transferred into UB from junior college). UB is rebuilding on offense. The defense has a lot of experience back but ranked 10th in yards and 12th (last) in points allowed in MAC games last season. Leipold says the reason to be encouraged on offense starts with 6-foot-7 quarterback Tyree Jackson, the heralded sophomore from Michigan who started nine games last season. What did Leipold see from Jackson in preseason? Jackson has two good-sized athletes at receiver in junior Anthony Johnson and senior Kamathi Holsey. UB lost star running back Jordan Johnson but has recruited well at the position. Junior Johnathan Hawkins is the prospective starter, backed up by red-shirt freshmen Theo Anderson and Kameron Pickett and sophomore Emmanuel Reed. “Running back and corner and sometimes wide receiver are where you can throw a younger guy out there,” Leipold said. Leipold sees continuity helping the defense, where seven starters return. Leipold also is happy to report some success off the field. UB’s summer training camp begins Monday.